The inimitable Pop band "Genesis" finally goes prog. Haha, charade we are. 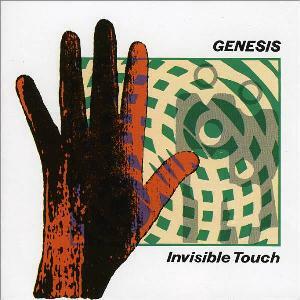 Released after their self titled album, Invisible Touch on the surface seems more progressive than the last album, but it is not. This is even more glaring radio pop. Where the previous album had an at times dark feel, and an enjoyable atmosphere, not to mention the melodies weren't half bad, everything here seems even more washed up and uninspired. Title track is some laughable dance pop, with a somewhat enjoyable main melody line. The electronic vibe gets old rather quickly, though. Those goofy middle section keyboard noises make me weep, though. But my word, it is still catchy. Tonight, Tonight, Tonight goes on too long. To me, this is Phil Collins trying to be Peter Gabriel solo, and failing pretty hard. The guy still sings well, though. Nothing here catches you like it should. The solo is one of the most uninspired things I have heard in a good while. Land Of Confusion is the big radio hit, and I suppose that is a deserved facet. Still, Home By The Sea makes this look pretty bad. Catchy and dance rocking all over the place, with facile society criticizing lyrics. In Too Deep softens it up, and delves into Phil's wet world of adult contemporary. This album is so very average in its pop craft, that I wonder truly what was going on. It sold well, yeah, but it is some very soulless radio pop. Anything She Does sounds like the theme song to a 1980's School time instructional video. Add that to the slowly devolving lyrics, and you've got yourself great Genesis pop...ugh. The "epic" track, Domino, is funny. Why? Because it is supposedly progressive. It is a shame that this is possibly the worst song on here. It is slow and crawling, but not in any great way. The atmosphere is literally non-existent. Groaning forward with uninspired poppy light. Hurts my head. Genesis is finally what it always wanted to be. That is right, an adult contemporary pop band. You could here it right from the start. That second song in Selling England, The dresses, the drummer. Anyway, Throwing It all away is painfully bare, and plodding. Forgettable? Of course. Tropical banality in extremis. The final song is no better. The Brazilian bores me dreadfully. Those keyboard hits are generic and simplistic. This takes the negative aspects of their previous effort and multiplies them. If you like decent pop, then this is a good purchase. Most anyone else will be quite bored with the whole affair. Not as dark or thrilling, not more than limp and dance pop. At least it isn't terrible. Is it? Best Song - Hard to say, possibly Land of Confusion. Worst Song - Hard to say, possibly all of them.